David Guy Stevens, of the Law Offices of David Guy Stevens, is collecting school and art supplies for a local grammar school and in honor of the Lily Sarah Grace Fund. I believe every child has a gift, and I am proud to help nurture that gift by collecting and donating art as well as school supplies, thus bringing art and creativity back into classrooms as well as much-needed supplies. Attorney David Guy Stevens, founder of the Law Offices of David Guy Stevens, LLC, recently announced he will be collecting school and art supplies inspired by the Lily Sarah Grace Fund and on behalf of Beebe Elementary School in Naperville, IL, starting May 1. “I believe every child has a gift, and I am proud to help nurture that gift by collecting and donating art as well as school supplies, thus bringing art and creativity back into classrooms as well as much-needed supplies,” said Stevens, a former art teacher. Lily, Sarah and Grace were three vibrant, intelligent, creative sisters, each with their own individual strengths. On Christmas day, 2011, 9-year-old Lily and her twin 7-year-old sisters Sarah and Grace, lost their lives in a fire in Stamford, CT. To honor their lives, the sisters’ father started Lily Sarah Grace (LSG) to support what his daughters loved to do most in life: art. LSG brings art and creativity back into classrooms through a method of teaching that is dynamic, highly engaging and most importantly inclusive to all types of learners. LSG promises to work for all of America’s children to experience school as an oasis of learning. To donate supplies, drop by the Law Offices of David Guy Stevens Monday through Friday from 1-5 p.m., located next to the Fox Valley Mall at 75 Executive Drive, Suite 357, Aurora, or call (630) 486-1080. 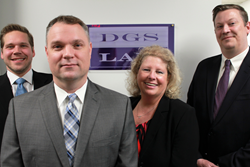 David Guy Stevens has a team of skilled attorneys who practice in the areas of criminal defense, DUI, divorce, child custody, child support and personal injury. For more information, please call (630) 486-1080, or visit http://www.davidstevenslawoffice.com.